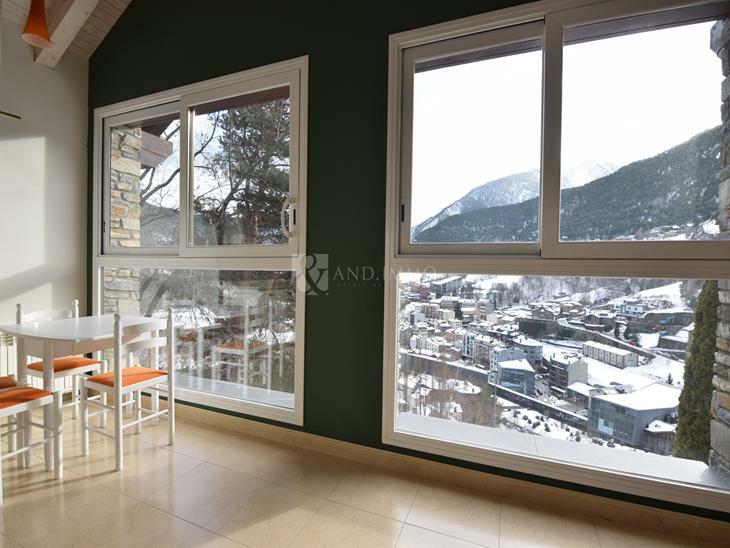 Spectacular chalet in privileged and sought after area of La Massana, next to the ski resort of Vallnord. The villa has 5 levels connected with lift for up to 6 people and a majestic design staircase, the lining is made of natural stone from the south of France, the style is a combination of modern and rustic and will detail the features that make of This unique property. On the ground floor, there are two entrances, the parking with automatic door and this has capacity for 7 cars, and the entrance for pedestrians, with a large hallway surrounded by large built-in wardrobes, leading to the elevator or stairs. In this plant, we also find a design and exclusive winery, as well as several technical rooms, geothermal heating, rainwater recovery tanks for the garden, gas for the kitchen, as well as 2 large storage rooms. The next level is designed to enjoy, we find the fascinating spa area, the floor is made of natural wood and consists of an indoor pool, a design Turkish bath, a sauna and a large gym. The velux windows let in natural light. We follow leisure with a party room and a library. In addition, a double bedroom with shower and a toilet. On the second level, we reach the day area, large open room where we find the spectacular kitchen with bar, high-end appliances. A large dining room in double height where in the center a fireplace is played in the shape of a pyramid. This floor also has a large double bedroom with its bathroom with shower. This plant is surrounded by garden and terrace with wooden floor, and has access from all rooms, has taken into account privacy and all the windows of the large windows have a layer that provides opacity and does not let the interior. The third floor is at night, impressive the main bedroom in suite with its bathroom with jacuzzi and shower, large dressing room and spectacular views from where to wake up is a gift. Two double in suite bedrooms with bathrooms and large fitted wardrobes complete the third floor. The top floor can be used as study or inspiration room, is based on a large diaphanous room with spectacular windows, large skylights on the ceiling, a design fireplace and a toilet. The whole property consists of integrated lighting in the ceiling, all the wiring is done consciously to derive in a central home automation system, the blinds are automatic, and consists of alarm system.